The oil is stored in our high-quality stainless steel tanks, under a protective layer of inert gas in order to protect its outstanding quality. Bottle-filling occurs only at time of delivery, in a specially developed procedure: the bottles are filled under vacuum to avoid oxygen remaining in the neck of the bottle. For this, we use special bottles that guarantee absolute light protection. This unique combination offers optimal protection for the valuable ingredients. A note on the taste: Biological OLI DE SANTANYI – the “green gold” is a very structured olive oil with green, fruity flavours, a touch of bitterness and a fine piquancy. Recommended: for salads, Pa amb oli, antipasti, pasta, vegetables, meat and fish. 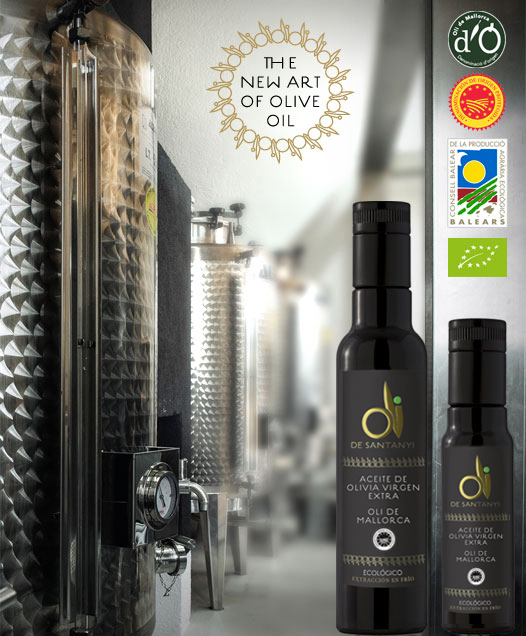 “OLI DE SANTANYI“ Our bio-certified olive oil from the new harvest will be available at the end of November and delivered from December. Our oil is strictly limited therefore we would be happy if you could place your order as soon as possible. The outstanding quality of our oil is confirmed by analysis and sensory Report ( laboratory ljb, Barcelona, Paneltest Generalitat de Catalunya, Laboratory Q.M., Sevilla). A balanced nutrition and daily use of olive oil help to stay healthy. This has been verified by recent scientific studies. The positive effect of olive oil is due to the high proportion of mono-unsaturated fatty acids and antioxidants contained in the oil, as well as the unique combination of other ingredients. Phenols, vitamin E, sterols, squalene, oleocanthal, etc. prevent or slow down pathological processes. Olive oil – the better, the healthier! The organic OLI DE SANTANYI contains a particularly high proportion of valuable polyphenols etc. and no harmful substances such as pesticides. The high quality is due to the early harvesting time and the high-tech process for oil extraction. Only olive oil with a high content of antioxidative polyphenols of over 250 mg/kg has a therapeutic effect. While supermarket oil often contains only about 60 mg/kg, OLI DE SANTANYI reaches values of over 600 mg/kg*. We recommend: A tablespoon (10-15ml) of OLI DE SANTANYI every morning. In addition, many other foods can be enhanced with the oil, in order to increase the total amount taken.